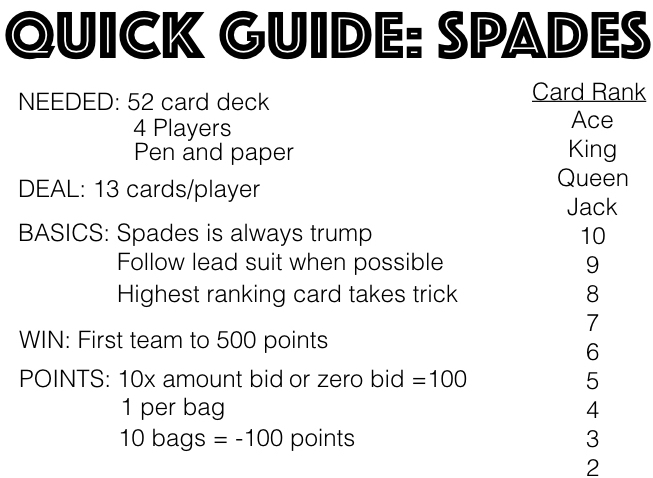 Spades is a strategic, trick-taking card game. Correctly predict the amount of tricks you will take each round in order to score the most points and avoid going set. First to 500 points wins! Below you will find the video tutorial and explanation for the 4 player version, followed by the video tutorial and explanation for the 2 player version. Deal: Each player is dealt 13 cards, one card at a time. Objective: Be the first team to score 500 points. Points are scored by taking, at least, the amount of tricks bid by your team. Card Rank: Ace, King, Queen, Jack, 10, 9 , 8, 7, 6, 5, 4, 3, 2. Spades outrank all other suited cards. Biding: Starting with the player left of the dealer, each player will bid how many tricks he/she will win during the round. Game Play: The player left of the dealer leads the first card for the first trick. Each player is required to play a card in the same suit of the lead card whenever possible. If a player cannot follow the lead suit, the player can play any card. The winner of the trick is the player with the highest ranking spade. If no spade was played, the winner is the player with the highest ranking card in the lead suit. The winner of the trick will lead the next trick. A trick cannot be lead with a spade suited card unless a player has only spade suited cards left, or spades have been broken. Spades are broken when a player cannot follow the lead suit and plays a spade onto a trick. Scoring: When a team combines to win the amount of tricks bid or more the team is awarded 10 times their bid plus 1 additional point for each extra trick won over their bid. For example, if a team bids 5 tricks and wins 6 tricks they are awarded 51 points (5 x 10 + 1 = 51). If a team wins fewer tricks than bid their score goes down 10 times the amount bid. Each individual player is not required to win the amount of tricks originally bid. A team combines their tricks won during the round to compare against their combined amount bid. Each additional trick won over a team’s combined bids is referred to as a sandbag. Every time a team gets to 10 sandbags during the game 100 points is taken from their score. The nil bidder takes 1 trick and the other player takes 4 tricks = -59 points (-100 + 1 + 4 x 10). This results in the team having 1 sandbag. Blind Nil Bid: A player can bid nil without looking at his/her hand. The effect is the same as a nil bid, but now has a value of 200 points. Setup: A shuffled deck is placed between the 2 players. Players build their hands by drawing cards from the deck. The first card a player draws can be kept or discarded. The same player will draw the next card too. If the player kept the first card drawn, the second card is looked at but has to be discarded. If the first card was discarded, the second card drawn has to be kept. Objective: Be the first player to score 500 points. Points are scored by taking, at least, the amount of tricks you bid. Biding: The player that did not shuffle the deck will bid first. Each player will bid how many tricks he/she will win during the round. Game Play: The player that bid first leads the first card for the first trick. Each player is required to play a card in the same suit of the lead card whenever possible. If a player cannot follow the lead suit the player can play any card. The winner of the trick is the player with the highest ranking spade. If no spade was played, the winner is the player with the highest ranking card in the lead suit. The winner of the trick will lead the next trick. A trick cannot be lead with a spade suited card unless a player has only spade suited cards left or spades have been broken. Spades are broken when a player cannot follow the lead suit and plays a spade onto the trick. Score: When a player wins the amount of tricks bid or more he/she is awarded 10 times the amount bid plus 1 additional point for each extra trick won over the bid. For example, if a player bids 5 tricks and wins 6 tricks he/she is awarded 51 points (5 x 10 + 1 = 51). If a player wins fewer tricks than bid his/her score goes down 10 times the amount bid. Each additional trick won over a player’s bid is referred to as a sandbag. Every time a player gets to 10 sandbags during the game 100 points is taken from his/her score. Nil Bid: If a player bids zero tricks and takes zero tricks during the round, it is worth 100 points. If a player takes one or more tricks on a nil bid, it is negative 100 points.